How do I change the background color and text of ToolbarItems? The default color is black and I would like to change how to do it? @JPHochbaum This will change the background color of the ToolbarItems and the text, but it will not change the ToolbarItem that has the black background color, as shown in the image, I want to change this small menu that has the black background. 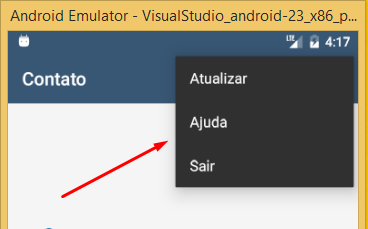 You need to do it in the Android Styles.xml. Can't remember off the top of my head, but you set the menu style to a style with a different primary color I believe. Hope that points you in the right direction. thanks it worked for me! Thanks, for this solution! It's worked fine for Android. But, do you have a solution for IOS?